I love hearts. So as more and more hearts start to pop up all around this time of year, I smile. I was smiling big when I found this at the Target One Spot: True, it is actually $2.50, rather that a true one spot, but isn't it cute? I already made some adorable muffins in it (tip: take a toothpick about 5 minutes before they are done cooking to indent the top so it looks like a true heart when it is complete). Other ideas: mini-meatloaves, baked risotto hearts, homemade jell-o, baked mac n' cheese hearts, frozen treats...the list goes on! So pick one up before they are all gone! 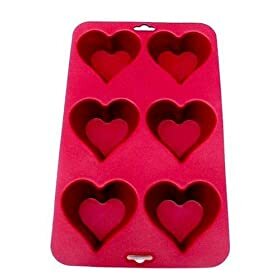 I have the mini one and use it for ice cubes and jello hearts.